When you hire any of our fleet from AC Travel you can be assured all our vehicles maintain our high standards, every year we invest a lot of money in our fleet and increasing our reputation as one of the most trusted and used services in the Hampshire area. 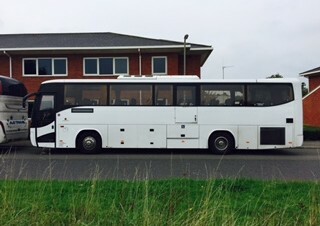 Every single one of our vehicles are regularly inspected and serviced by our local mechanics and meet the industry high standards in giving you first class coach hire, also ensuring the vehicle is road safe and reliable. With this you know AC Travel are reliable and road safe for any travel requirements you need. Our Luxury Mini Coach hire is perfectly suited for business trips, and those longer journeys. Your will arrive at your destination relaxed, comfortable and content, after a wonderful journey. Whichever minibus hire you choose, you will be in safe hands with our fully checked and insured drivers. Hiring a luxury mini coach or minibus in Hampshire has never been as easy as it is with AC Travel. We offer the highest customer service levels, to ensure that the planning of your trip is as easy and stress free as the journey itself. We have a wide range of minibuses for hire, including a range of luxury mini coaches, which can seat between 14 and 29 people each, please check them out below or click one of the buttons below which will take you to the right section. For minibus hire and luxury mini coach hire in Hampshire, then you will see that AC Travel is the best company for your needs.